After the fall of the Iron Curtain the development of the memorial site was characterized by the lack of planning security and little progress. Changes in the ownership made a conceptual development nearly impossible. This changed in December 2010 when the district of Saalfeld-Rudolstadt acquired the property that had been behind barbed wire. Only then began a review of the memorial which included the integration of important historic buildings. The ownership was also a prerequisite for the Thuringian Ministry for Education, Science and Culture to provide funds. 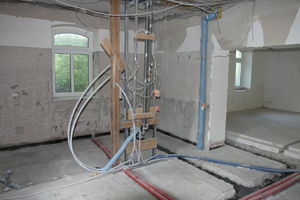 The new concept was developed by the cultural department of the district administration in close cooperation with the experts from Buchenwald and Mittelbau-Dora as well as the Friends’ Association of Laura. The Thuringian authority for the protection of historic monuments was consulted on conservation issues. The supreme rule in the process was to treat historic marks with the greatest care, especially the great barn that had served as main accommodation for the prisoners. At the same time the memorial was to be equipped with up-to-date visitor’s facilities – a premier in its existence. The consequence was to establish a modern visitor centre in one of the buildings and to refrain from significant building works in the great barn. The former prisoners’ kitchen should serve as information and staff office. created by breaking down the walls of smaller rooms. In this hall the first, introductory, part of the exposition and a true to scale model of the subcamp is located. The room is equipped with modern presentation technique to show films. A kitchenette allows us to provide for visitors during work shops and events. During the existence of the camp an old barn had been turned into a kitchen for the prisoners. An exceptionally large chimney still bears witness to this period. 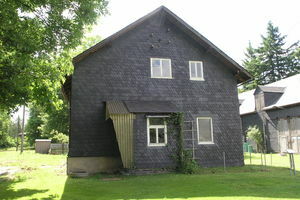 After WWII until the 1990s this building served as residential house to the Ludwig family. Due to its central location and its size the house proved ideal as visitor information and staff office. In the course of refurbishment decorations of the camp time were found and revealed. In the office visitors get information material such as brochures. DVDs and books about the memorial site can be purchased. 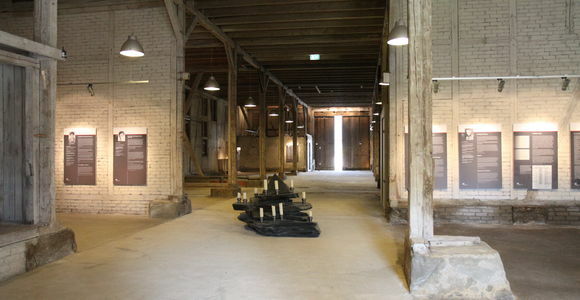 The great barn as former main accommodation of prisoners is the most important component of the memorial site. In 1979 the memorial site was established in one third of the barn, the remaining part was used by the farm. The goal of the new concept was to open this latter part for visitors. A brick wall that separated the memorial site from the rest of the building was demolished. The building can now be experienced as a whole. 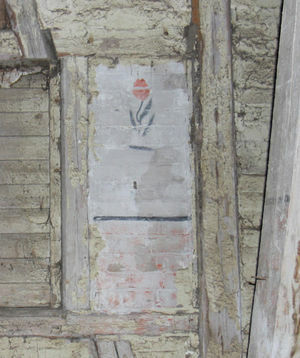 During an examination by restorers wall decorations from the prisoners were found under newer layers of paint. They were revealed by experts. These decorations are rare and valuable historic evidence of the camp time. They have to be preserved under all circumstances. We refrained from re-installing windows, because their exact former position could not be proved. The slate altar that had been erected in the old memorial site was not moved. The focus of further restoration will be on the protection of the building and its evidence of the past.